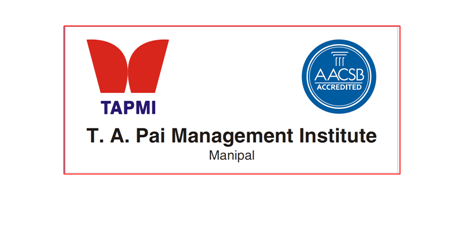 It was an evening to remember for the students of T. A. Pai Management Institute (TAPMI), Manipal, when they were graced with the presence of one of India’s most distinguished jurists and a prominent anti-corruption crusader, Justice Shri. Santosh Hegde. He delivered the 30th T A Pai Memorial Lecture, to commemorate the 90th birth Anniversary of TAPMI’s founder, the great visionary, Padma Bhushan awardee Shri. T. A. Pai. Shri Hegde started by delving into the history of the Indian republic, and how our founding fathers envisaged the new country to be in the future. He charted the exact chronology of the formation of the Indian constitution, from its establishment to its final adoption. He described the roles and responsibilities of the three pillars of the constitution, the legislature, the executive and the judiciary, thereby laying the context and the foundation for his lecture, “What is left of democracy in India”. Justice Hegde, started off with the examples of various misdemeanors that have happened in the Indian legislature in the recent past. Reciting a few anecdotes, he not only illustrated the apathy that has seeped into our legislature but also the increasing instances of corruption and the criminalization. He recalled the instances of the absence of 34 Members of Parliament from the question hour, after they had submitted questions. He also highlighted the growing instances of some MPs with serious criminal records (One in 13 Parliamentarians, according to Justice Hegde) and the disproportionate increase in their assets after they took office. From the Legislature, Justice Hegde moved on to the executive and explained how the subordination of the executive to the cabinet ensured its subservience. He quoted of instances where the elected ministers demanded Officers of their choice in their constituencies and of Officers cultivating elected representatives. He spoke of the growing affinity of the legislature and the executive by describing them as conjoint twins. He elaborated on how this affinity is seriously jeopardizing the effective running of the institution. Justice Hegde however did not restrict himself only to the legislature and the executive. He did not spare the institution that he served with great distinction for over 40 years, the judiciary. He underscored the importance of the judiciary in today’s times by terming it as the savior when the executive fails. He however lamented the fall in the standards of probity of the Indian judiciary and quoted the recent cases of some high court judges resigning to avoid facing impeachment, the CBI investigation of 34 judges in the Allahabad high court and the case of a judge conducting a contempt of court proceedings on a railway platform on account of the denial of a railway berth, to back his assertion. He also expressed concern at the judge to citizen ratio in India and the inordinate delays in the delivery of justice to a common citizen. Justice Hegde concluded his enlightening lecture, by recognizing the growing role of the media as a moral and an ethical watchdog by terming it as the unofficial fourth pillar of the constitution. He underscored the importance of probity in today’s media lest it has a disastrous effect on the functioning of the democracy. However, inspite of the cracks in the structure of our constitution, Justice Hegde asserted that the democracy was the best form of governance for our country and expressed hope and optimism that it will lead us to a bright future. Earlier, Dr R C Natarajan, Director welcomed the gathering and recalled the yeoman services rendered by late Shri. T A Pai in various roles played by him in Industry and Political administration. Dr Ramdas Pai, Chairman of TAPMI Governing Council presided over the function. Prof. Raghunath Rudran, Professor and 2 Staff members were felicitated for long service at TAPMI.